DETROIT - Local 4 will host a gubernatorial debate between candidates Bill Schuette and Gretchen Whitmer at 8 p.m. Wednesday, Oct. 24. Kimberly Gill and Devin Scillian will moderate the event at the Local 4 studios in Downtown Detroit. It's the only Metro Detroit debate in which the candidates will participate. Schuette, the state's attorney general, is the Republican candidate for governor. His running mate is Lisa Posthumus Lyons. Whitmer, a former legislative leader, is the Democratic candidate for governor. Her running mate is Garlin Gilchrist II. An exclusive WDIV/Detroit News poll showed Whitmer with a double-digit lead over Schuette. Whitmer was closing in on 50 percent of the vote with only 10 percent of voters undecided, according to the poll results. "There are a couple of things happening here," said Richard Czuba, CEO of the Glengariff Group. "First of all, Bill Schuette came out of the primary damaged when you look at his favorable to unfavorable numbers. With independents, he is under water by a two-to-one margin." Among independents, 88.4 percent said they know Schuette, but only 26.2 percent have a favorable opinion of him. 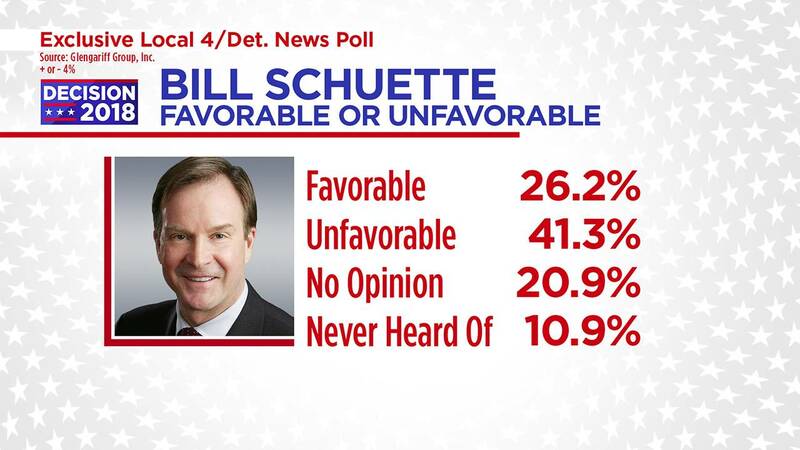 Bill Schuette has 88.4 percent name identification, breaking 26.2 percent favorable to 41.3 percent unfavorable. Bill Schuette’s name identification is under water by 14.1 percent. Independents have an unfavorable opinion of Bill Schuette with only 18.7 percent viewing him favorably while 37.4 percent view him unfavorably. Schuette is viewed unfavorably by independent voters by a 2-1 margin. Gretchen Whitmer has 80.9 percent name identification, breaking 39.3 percent favorable to 19.1 percent unfavorable. 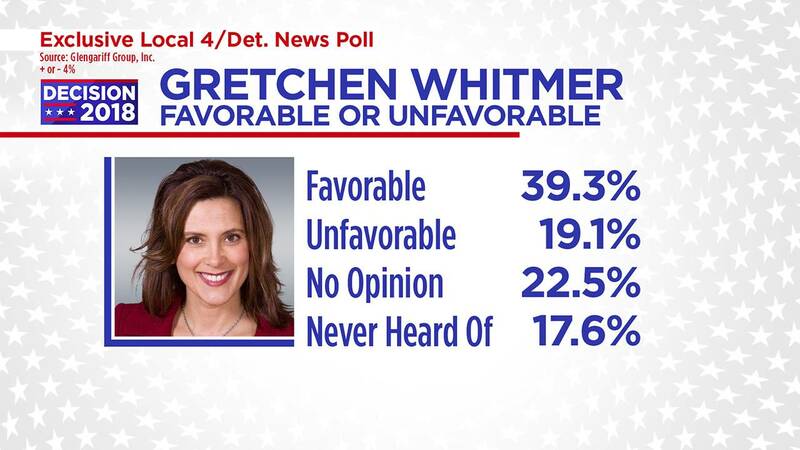 Independents have a favorable opinion of Gretchen Whitmer with 35.0 percent viewing her favorably and 14.6 percent viewing her unfavorably. Whitmer leads among Independent voters by a margin of 39.0-25.2 percent -- a 13.8 percent lead. The race is tied in out-state with Whitmer at 42.8 percent and Schuette at 42.5 percent. But in Metro Detroit, Whitmer wallops Schuette by a margin of 56.6-29.8 percent -- a 26.8 percent lead. Whitmer leads among men 46.3 percent-39.8 percent -- a 6.5 percent lead. But Whitmer holds a lead of 53.2 percent-32.5 percent among women – a lead of 20.7 percent. Schuette only leads among men with a high school education at 47.6 percent-36.1 percent. Whitmer leads among men with some post high education by a margin of 50.0 percent-36.1 percent and among college-educated men 48.4 percent-38.4 percent. Whitmer leads women of all education levels. Whitmer leads among women with a high school education 52.1 percent-36.7 percent. She leads among women with some post high school education by a margin of 47.7 percent-36.3 percent. But she holds a lead among college-educated women 56.5 percent-28.6 percent. Among voters over 65 years old, Whitmer leads 52.9-35.0 percent -- a 27.9 percent lead. The Glengariff Group, Inc. conducted a Michigan statewide survey of November 2018 likely general election voters. The 600 sample, live operator telephone survey was conducted on September 5-7, 2018 and has a margin of error of +/-4.0 percent with a 95 percent level of confidence. 64.0 percent of respondents were contacted via landline telephone. 36.0 percent of respondents were contacted via cell phone telephone. This survey was commissioned by WDIV Local 4 and the Detroit News.